I hope your stuffing was tasty and your turkey was plump. May your potatoes and gravy have never a lump! I hope your yams were delicious and your pies took the prize. And now it’s time to get out there for some local buys! 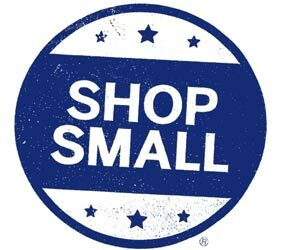 Happy Small Business Saturday! We certainly hope everyone had a wonderful Thanksgiving. If you skipped yesterday’s shopping (Black Friday, who can blame you? ), then maybe it’s time to venture outside the house and take a little break from your relatives. Or maybe you want to bring them along—all the better! The good news is, you don’t have to venture very far today, as we’re celebrating those hard-working small businesses in our neighborhoods. When it comes to being a small business owner, I see the trials and tribulations right in my backyard. I see my husband putting every ounce of hard work and care into his restaurant, and here I am with my own little agency, which I’ve built from the ground up. Not only do small businesses make the economy go round and serve as a symbol of the of the “American Dream.” But they provide an added value for the customer as well. There’s a personal touch that gets lost in large corporations. As a small-business owner, I know my customers. I know who they are and who their children are. I know the names of their dogs and cats. I know whether they like their coffee black and their cocktails shaken or stirred. ‘Small business’ is business with a little more heart and soul. The other day, I swung by the Georgetown Emporium (a small second-hand antique shop) just in time for them to be closing their doors. I was hoping to buy a special present for a friend. “Oh no, are you leaving?” I asked. Wouldn’t you know it, she opened the place back up just so I could pick out the item I came for. That’s the beauty of small business, big hearts! Sometimes less can be more. Plenty of companies and business communities are offering special incentives today (you may have seen the American Express commercials on TV). Incentives aside, I encourage you to get out there and support the local businesses you love. Not just today, but year-round. Because without your love and loyalty, they couldn’t survive! This entry was posted on November 30, 2013 by Simone in SIMONE SEZ.